Action? Most of us get no closer to the Arabian Peninsula than King Solomon’s medjool dates, and why not? 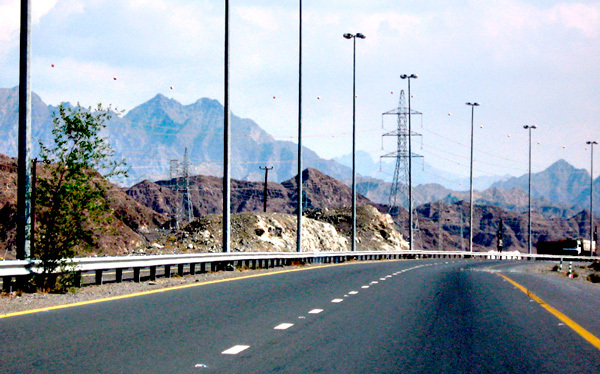 If you had a choice between your home town and anywhere in the Arabian Peninsula, which would you choose? My disclaimer is that previously I have lived 20 some *odd* years in and around the Arabian Peninsula. Gimme some of that Dubai, if you will. Go light on the Empty Quarter. And one thimble of Arabic coffee with the dates, please. Humans + Landscape = ? In between my infrequent blog entries, which always focus on humans and landscape, I am writing adventure novels, not surprisingly on humans and landscape. As you can see from the menu bar above, I have been working on four novels over the past six years. In preparation for updating them on my blog this fall, I have had some fun doing themed graphic design, one composite image for each of the four novels. Yes—unique to each novel—humans interacting with the exotic geography and inspirational landscape around them, with the lightest sprinkling of ethnobotany. I have interpreted each of the four novels below and I hope you find them enjoyable. If so, recommend them to your like-minded friends, please. This is the least developed adventure to date. 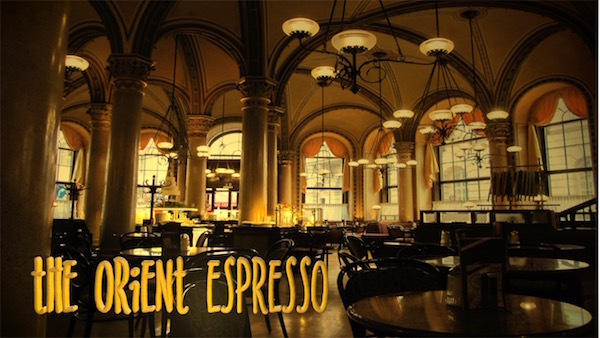 The story revolves around a coffee house in Vienna–a place where for centuries East and West have and continue to struggle…over espresso…the text offering a brief respite. The landscape background is the Arabian Peninsula’s Empty Quarter where surface sand patterns take us to Julian eternities and the sun takes away our sight. The botanical panel is the date palm, Phoenix canariensis providing food, utensils, environmental and architectural shelter. The human craft panel is carved stone–essential discipline. The text is the gold ring. The Moroccan landscape background threatens with an irritating red born of never-truly-healed and always festering cultural conflict wounds–North African, Arabian, Sub-Saharan African and European–in equal measures macerating humans over millennia. The botanical panel is the fruit and foliage of the fig, Ficus carica–rare relief. 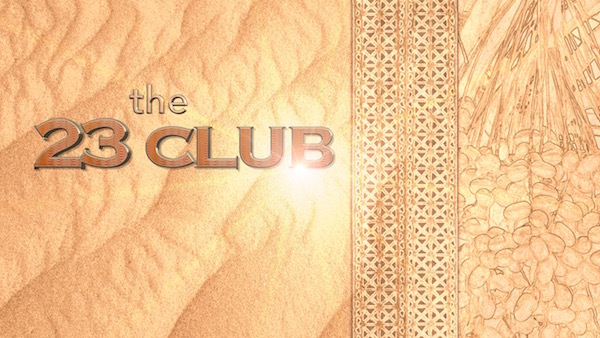 The human craft shows patterns from North African Berber wool carpets–practical essentials. The text is the shelter humans take from the native and endemic forms of the plant, Cannabis sativa. The dreams are real life. The dark green and blue landscape background is the edge of our dreams always implanted by the highland mountains, forests, lakes, rivers and streams of the Swiss Alps. The botanical panel is the gentian, Gentiana acaulis, whose blue beauty, paired with our rare good fortune, beckons human transformation. The human craft panel patterns are the lace of internal order. The text is the promise of clarity–or is it simply the hope of clarity? Lived lots of years in foreign countries–foreign cultures. Cross-cultural are experiences in which I have been face-to-face with people and behaviours I did not understand and often did not agree. …as opposed to multi-cultural which is theory only. In my work as a landscape architect in those foreign countries and foreign cultures, I had to build major projects. Had to reach workable agreements in difficult cross-cultural conditions. Learned so very much from so many different people. The links below track some of my cross-cultural journeys. They are all HD, all less than one minute long, and they are all growing from the Empty Quarter, the Rub al Khali. Rub al Khali Enigma: the Empty Quarter in the Arabian Peninsula, what it is. 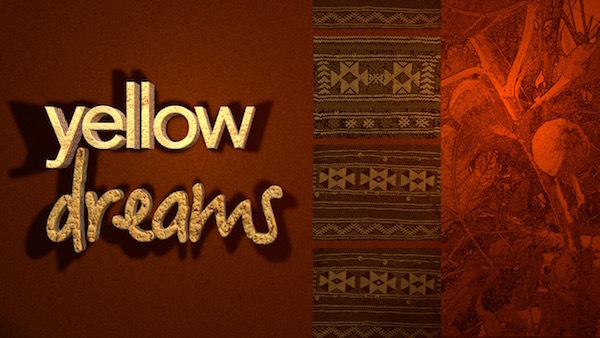 Dreams: how to get from dreams to fiction to reality, Atlantis Dubai 2008. Empty Quarter: transforming cross-cultural realties, harsh environments into restful shelter, Qasr al Sarab 2010. A Golf Academy in the Empty Quarter? 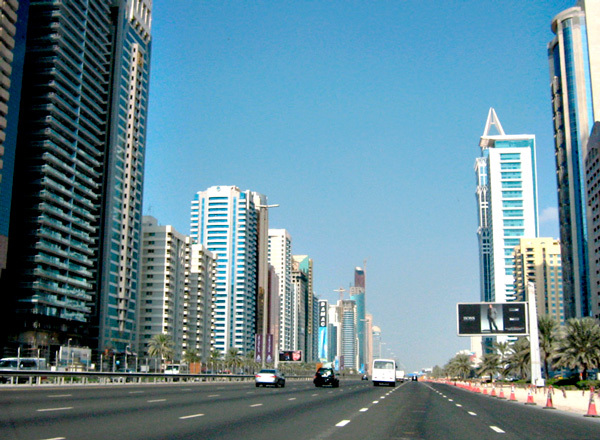 Dubai–pent up coast demand. Everybody lives in AC apartments; but humans flood the coast, climate permitting, weather permitting. 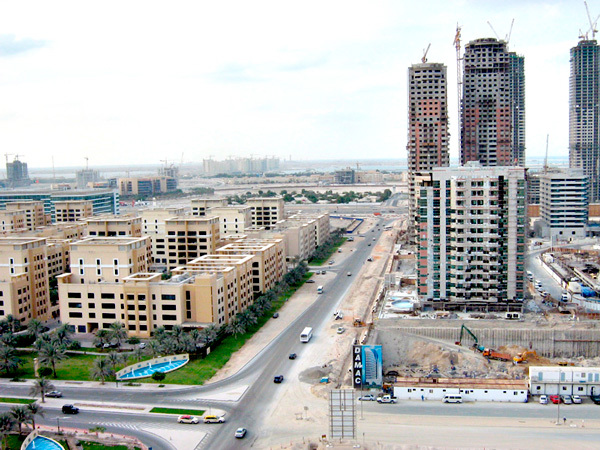 Dubai–pent up park demand. Weather permitting, climate permitting–a green park on the coast. Remember the landscape context–this is the Empty Quarter–coastal edge, coastal zone. Blue or green is rare and highly sought after, difficult to access. The coast line of the Gulf. City parks. The above two images are what I think the planners call ‘pent up demand’. But you’ve got to drive to get to these nodes. 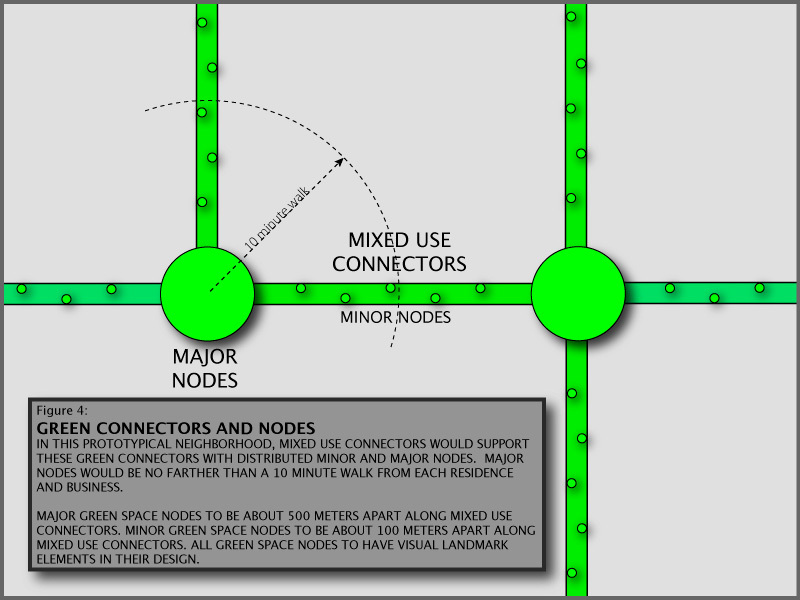 Tell me these green and blue major recreation nodes should not be 10 minutes or less walking from every front door. Where’s the coast? Where’s the park? How do I get there? Dense apartment life everywhere–that is Dubai. 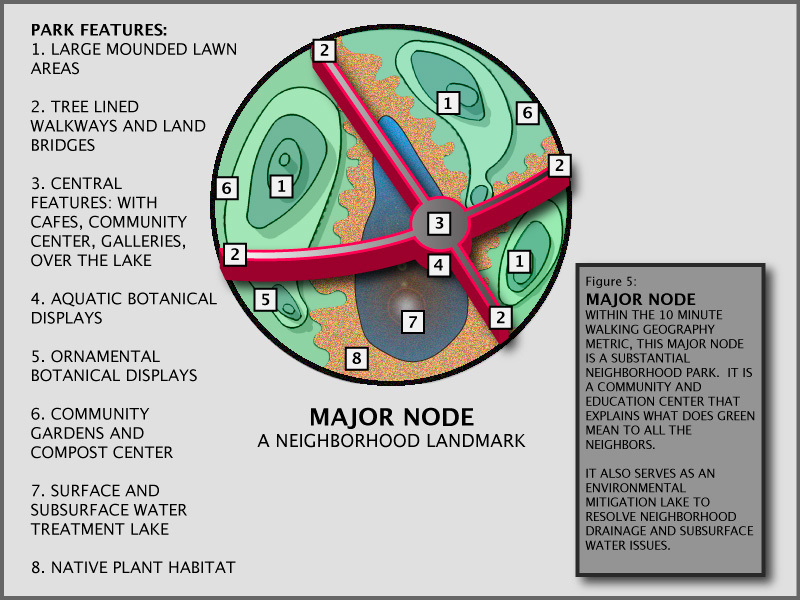 So I said what might that locally accessible (ten minute walk max) neighbourhood park look like? Dubai Dream–should be a major node, a landmark–something to organise the neighbourhood around–next to the local mosque. Need green? It’s the plants! You need the plants. 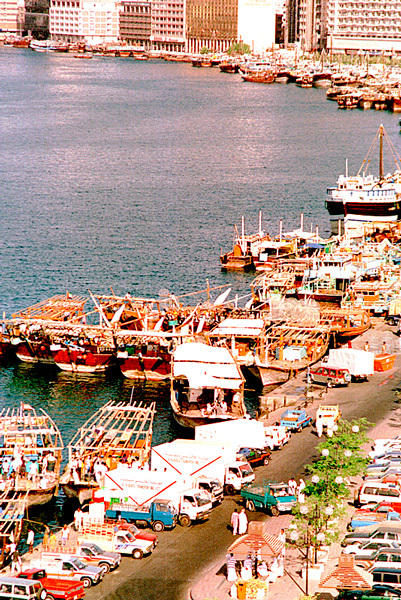 Dubai Municipality sits in the Coastal Zone. 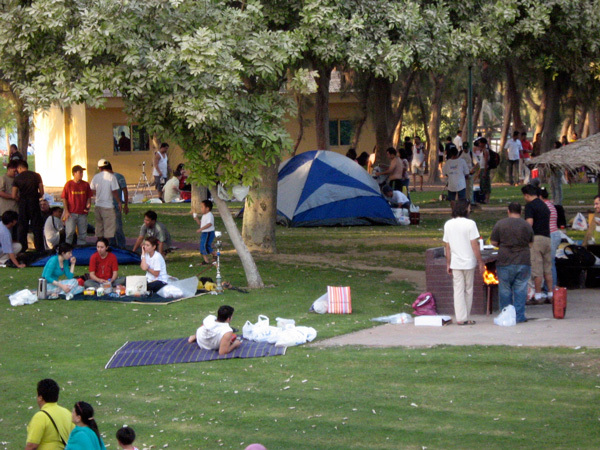 Al Ain is an oasis in the Desert Zone. 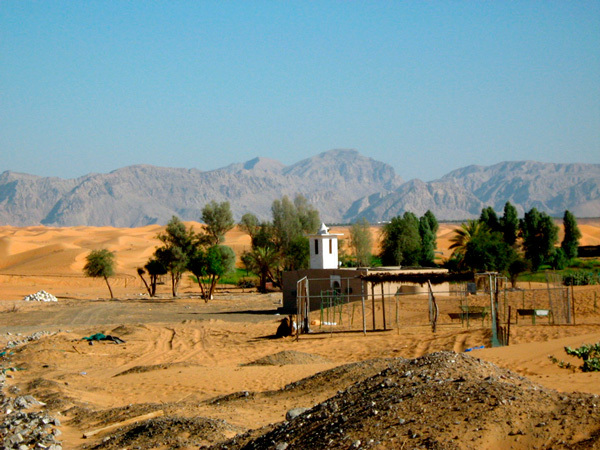 The oasis is supplied by rare monsoon remnants, from the Gulf of Oman, captured by the Hajar Mountains in the Mountain Zone. I wanted to understand a little more about the larger landscape into which the Dubai Municipality sits. 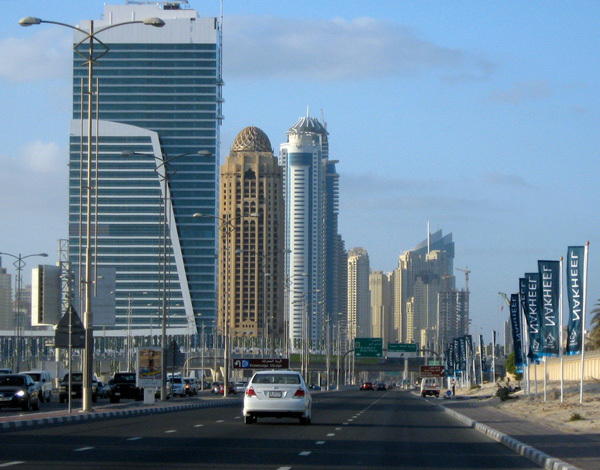 Dubai Municipality is just a narrow, but intensely built, strip along the edge of the Gulf. From the above satellite image–it is hardly visible. 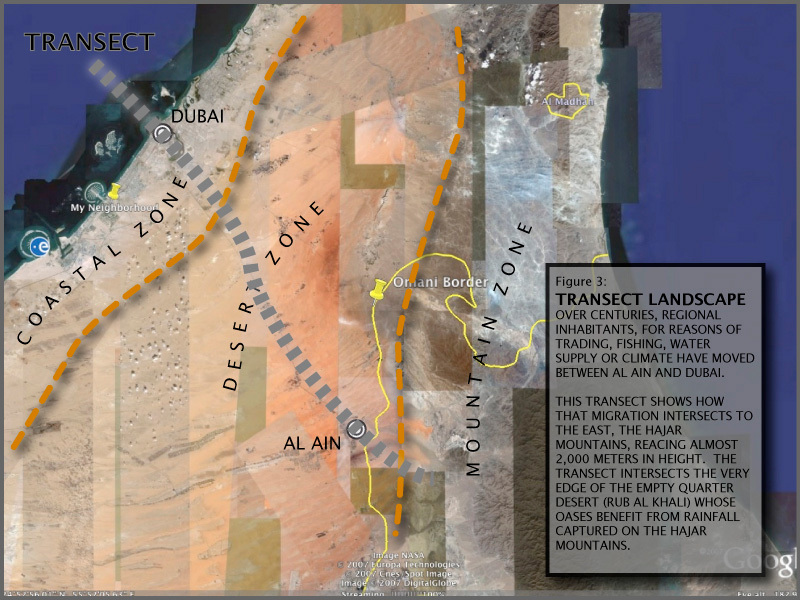 The landscape transect distance from Dubai, at the Gulf coastal edge, above on the left, across to the right to the Gulf of Oman is 100km. 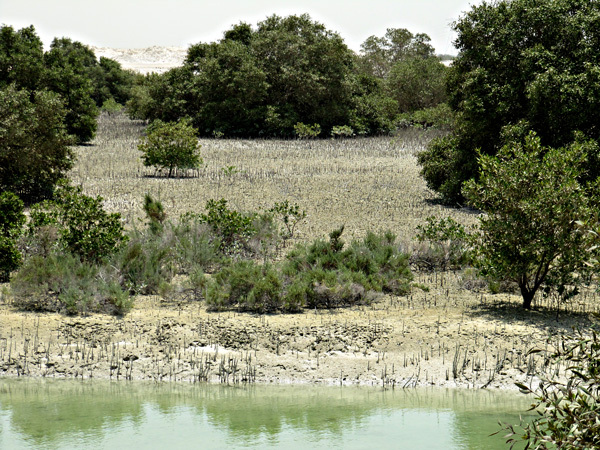 Coastal Zone, the Gulf coast Dubai urbanification (megalopolis hoards of humans hiding from the climate or mangroves). A Dutch doctor, a General Practitioner, Marijcke Jongbloed, lived in the United Arab Emirates for twenty years. 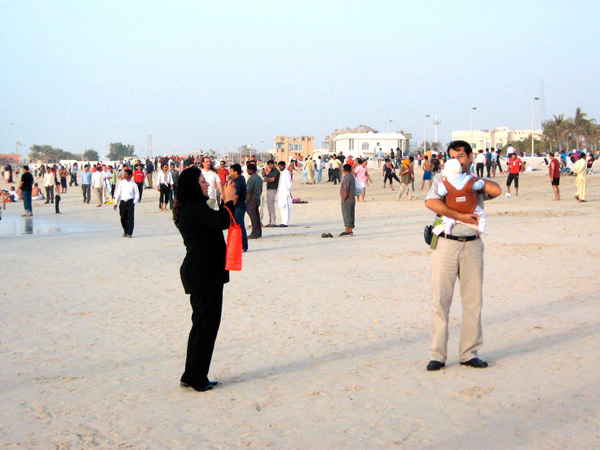 She surveyed, 1983-2003, the landscape of the UAE. 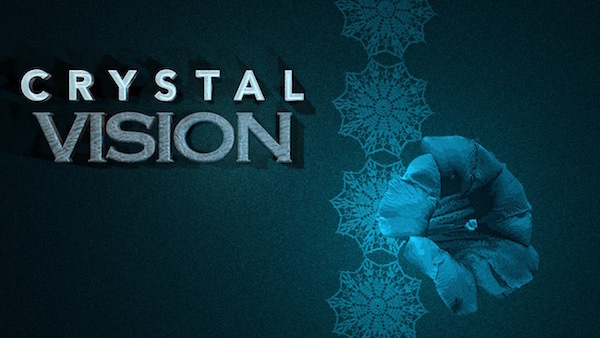 She compiled her findings in a book entitled, The Comprehensive Guide to the Wild Flowers of the United Arab Emirates. She photographed each plant in its natural habitat, annotated a location map and commented on how the plant was used by humans (ethnobotany). Best reference I found for plants in the UAE. Aladdin? A lamp? 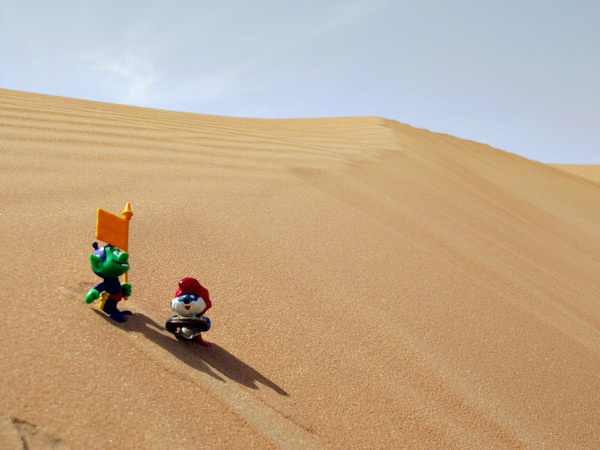 No, it’s the Empty Quarter and it’s full of sand and genies…No!! It’s full of djinnis and gnomes and surfs and a whole lot of people…but the humans only live along the edges, right? No, no, no…it is nothing…nothing but a mirage. Mirage…dream, dream, dream…when I want you in my arms, when I want you and all your charms…whenever I want you, all I have to do is dream…the Empty Quarter…dream. Born in Lausanne in 1784, and studied in Leipzig, Gottingen and Cambridge before heading to Arabia…he was a geographer and author, best known for having re-discovered in modern times the ruins of Petra, the Nabatean city in Jordan. Burckhardt was an explorer who spent three years in Syria learning the language and ways of Arabia before beginning his journey through the sands and on to Medina and Mecca. Burckhardt was a modest and self-effacing man whose careful accounts of his travels in Syria and Arabia are classics, and whose conversion to Islam was apparently sincere. Travelling as a poor man, Burckhardt drew close to the Arab tribes, he was depending upon them. His books tell the strange stories…lessons? The difference between truth, prejudice and political correctness can only be learned by the individual. But Burckhardt’s writings from two centuries ago and the contributions from many contemporary authors frame a window of understanding for that landscape and the humans who have called that desert their home. Is mystique the Empty Quarter landscape magnet for Western culture? If so, then how…why? How could a place, a landscape where cultures of India and Africa have interlaced for millennia be…empty? How can there be an Arabian Peninsula landscape virtually untouched by Islam these last 1400 Hegira years? But is this Empty Quarter mystique nothing more than a moth to fire? Everytime I think about our ‘modern technological tethers’, the real time information resources to which we are all accustomed, I am amazed by the strength and will power of these earlier explorers…and that gives their writing all the more gravitas.